I don’t see many movies, let alone a new release! Stop the presses. My daughter and I found ourselves with time to spare last night. I wasn’t so tired I had to flop in bed at 9:30. This movie was cued up and ready to go. The first twenty minutes of viewing, before the dramatic scene that sets the stage for the plot to unfold, are pure slogging. The viewer will almost wish something bad happens to the main character and her friends. They give a new meaning to the expression ‘mean girls’. Once Samantha has died and is thrust into a purgatory of reliving her last day on earth over and over, the movie gets interesting. The blurb summarizes nicely – discoveries are made, past behaviours are examined and a variety of denial mechanisms are brought into play. But ultimately, Samantha is forced to recognize her culpability in setting a terrible chain of events in motion. The twofold message of this movie is a great one for young and old alike. The plot aptly demonstrates how, with one tentative step after another – no choice earth shattering or worthy of pondering in and of itself – a person can end up on a path never planned for or anticipated. Even more important is the belief we all have that there will be endless time to get things right. We brush off behaviour that is petty, or mean or selfish. We know we’re better than that and we’re sure we’ll make it right in the future. But what happens if our time runs out? On any given day, are we ready to leave this life behind? Samantha discovers that living one day fully with not a single regret is all the preparation needed to make the ultimate sacrifice and leave this world knowing she made a difference. 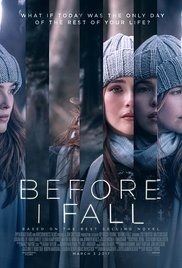 See Before I Fall with the young people in your life. Talk about the message. This movie will make you think. This entry was posted in Art, Movies, Parenting, Quotes and tagged 2017 must see movies, bullying, coming of age movies, morality, movies to see with your teen. Great points and thanks, Nicki, for enriching this post with your own observations. Sadly true – mistakes young people make can become life-altering. You’re just beginning to live – a heartfelt plea that many parents and concerned adults echo with you.